"He's a great closer, it's definitely going to be a case of who's got the mightier kick." - Andrew Wheating after the 800m semifinal rounds that saw the tall Oregon senior easily win his heat in 1:48 (Wheating: "The easiest 1:48 I've ever run") while UVA freshman Robby Andrews closed in 26 to run 1:45.54 and win the first heat where 5th place was 1:46.19 (Andrews: "It was just like any other race"). Pretend that you are Wheating, how will you beat Andrews? After the 10,000 any doubts that descending order qualifying is unfair? It's official... Nebraska joins the Big 10! Tyson Gay Out Of Adidas NY Grand Prix Usain Bolt had already pulled out of the meet with an injury. We wonder how deep in the summer we'll have to go before Bolt, Gay, or Powell race one another. adidas Grand Prix Start Lists The meet will be on live network television (NBC) in the US from 4-6pm Eastern on Saturday. The women's 1,500 and men's 800 are the top distance races for LRC fans. LRC $20,010 NCAA Distance Prediction Contest Show us your track and field knowledge and have some fun watching the NCAA meet. Our contest is pretty easy. Pick from our color-coded scorer the top 3 in each distance race and the team battle at the 2010 NCAA Track Champs in Eugene. We give you the top 10 athletes, their school, and top time in 2010. The first event's picks need to be in by 7:30pm Eastern Wednesday. LRC The Week That Was In Running This week we give props to Bernard Lagat for his new 5,000 AR and praise him for not putting it out of reach earlier in his career. Along the way, we also ponder if Dennis Mitchell is still a cheat and we give out props the arguably the most ignored American runner on the planet and ask you if you can tell us who has the Colorado school record at 5,000 meters. 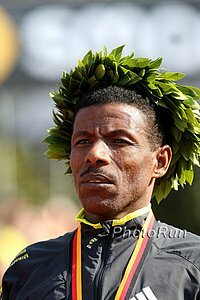 We also give props to World XC champ Emily Chebet, Haile Gebrselassie, Mary Wittenberg, Renato Canova and Nick Arciniaga. Plus our Race Video Of The Week and much more. The men's field was Rockin 'n' Rollin in San Diego, especially in the first 10-15k, as they rolled out in 29:34 before a Moroccan threw down a 4:26 mile. Yulia Gromova (2:27) won on the women's side for the 3rd straight year. World XC Champ Emily Chebet Sets Course Record 15:12 At Freihofer's Run For Women *Results State College's Rebecca Donaghue was the first American in solid 15:50 while the first three ran speedy 15:12, 15:20, 15:23. 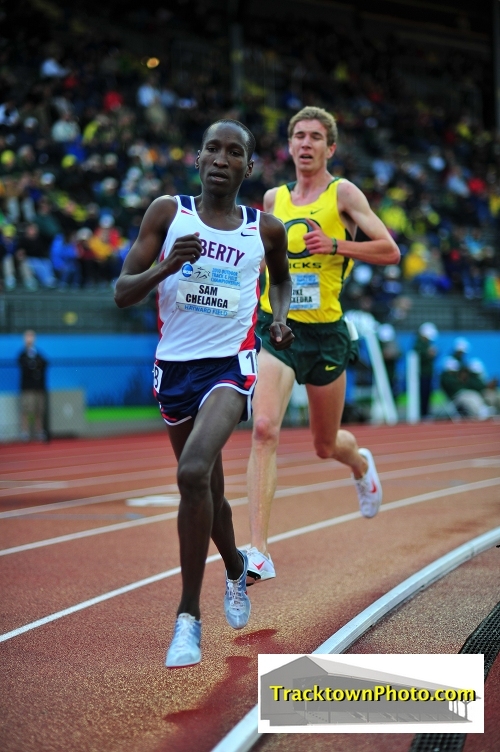 LRC Lagat Gets 5,000 American Record, Solinsky Runs 12:56! 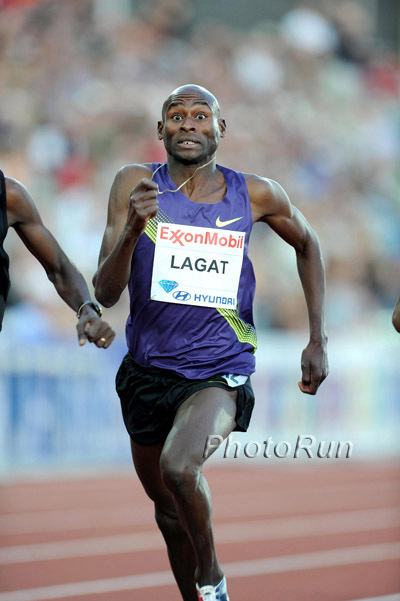 *How come Lagat does not get a Letsrun opening Flashpage that says, "LAGAT 12:54"
Video: Brian Sell Not Exactly Retired 2008 Olympian Brian Sell is finding it hard to stop competing and training. That's why we love him. Record-Breaking Marathon Cheating Grandpa Is Walking 340 Miles For Publicity! Was The 69-Year-Old DQed For Cutting London Marathon Trying To Cheat? He claims he was simply dropping out. Others aren't so sure and think he wanted a record. We have found his finishing photo on the left. True Headline: UK College Graduate To Race Steam Train To Combat Obesity Sounds like a plan! Laura Roesler Ends Prep Career With Record 20 State Titles And Now She's Off To ... Oregon This probably should have been our quote of the day: "On Friday in the 100 preliminaries, Milbrath became the first North Dakota competitor to beat Roesler in any event since Roesler was in seventh grade." Yes, that's right, Roesler failed in her bid to win 5 state titles for 4 straight years, as she was finally beaten in the 100, where she said she is "vulnerable" - but mega props to her for her amazing run. Men's 800m Final - 8:40pm This race needs no intro. Women's 800m Final - 8:50pm Phoebe Wright goes for sub-2:00. 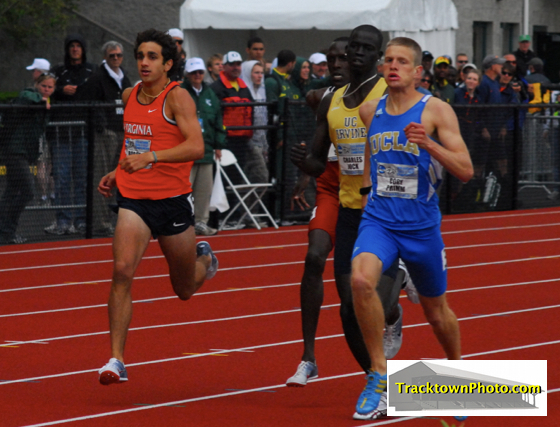 Men's Steeple Final - 9:00pm Can Princeton's Cabral get Ivy League's 2nd win? Women's 5,000m Final - 9:40pm Champion Bizzarri waits for dominant Koll. Interview With Princeton's 5k/Steeple NCAA Qualifier Donn Cabral Cabral ate a good steak between last Saturday's steeple and 5,000 and qualified for both, plus ran 4:00 for the mile in practice. Boards: Can Blood Or Bizarri Beat Koll At Eugene? Sam Chelanga Underappreciated Will he win the 10k/5k double? Chelanga ran 27:08 a few weeks ago although hardly anyone noticed. Hard to believe Galen Rupp, David McNeill and others have shut him out of NCAA track titles. *Nicole Blood Feature In Register Guard Props: Blood moved beyond her high school superstar days to become a big team contributor over time for the Ducks. IAAF Cutting Budget By $20 Million In 2012 Lamine Diack, the IAAF head who surprisingly announced a bid for re-election, says the IAAF is not in peril. Good Read: Extensive Interview With Jack Fultz, Winner Of The 1976 Run For The Hoses Boston Marathon In 90+ Degree Heat Fultz is still very involved with the sport, including directing the Ivy League Ekiden trip every year that helped Wejo, Rojo and Employee #1 travel and race in Japan. Cartoon - Wejo Impresses Danica Patrick Racing in the LetsRun singlet, Wejo impresses most ladies, even 37-minute 10k 8kers like Danica Patrick. If you were gone over the weekend, there weren't a ton of major surprises at regionals on the track, as (for the first time ever) everyone except multi-eventers had to qualify directly for NCAAs. Andrew Wheating did run a 3:37.52 PR and a 1:46.44 seasonal best, but some are wondering if Robby Andrews (who ran a 1:46.87 PR) will outkick him in the 800.